What type of chafing fuel can I use with this chafer? You can not use a traditional open-flame fuel source for drop-in chafers. You must use a universal electric heater. The Vollrath 46258 9 qt. New York, New York drop-in retractable dripless full size chafer is an elegant solution for your buffet or catering operation. Its distinctive, upscale appearance will accentuate any food presentation! The standard-setting look and durability make it a favorite of hotels, restaurants, and caterers seeking quality, elegance, and value. This chafer features a beautiful, brilliant, mirror-finished heavy-duty 18-8 stainless steel body with clear-coated brass accents that are durable and easy to clean. It's easy to install, securing to any countertop with two clips and screws (included). Once installed, the breakthrough hinge design works in closed, 90 degree, and fully open positions for serving flexibility with no switches or levers. At the same time, the specially-designed channeled cover accumulates condensation and directs it into the water pan instead of your food for improved food quality that your guests will appreciate. the best item I've ever purchased. For catering service, the best of best. you can hold your hot food during the service. 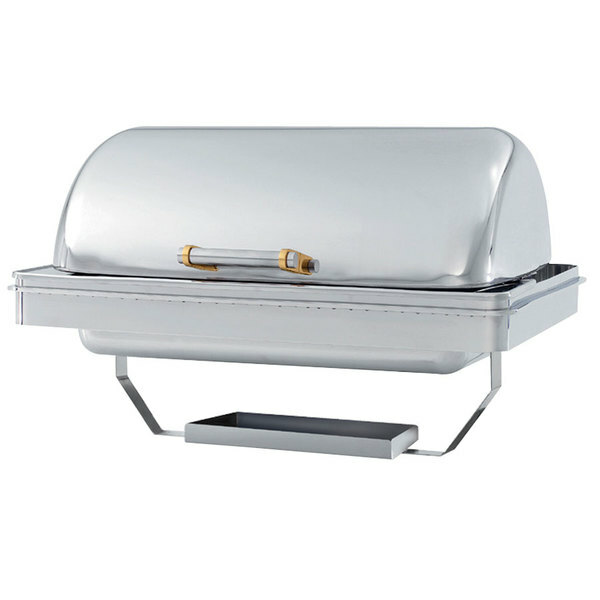 you can fit in one full hotel pan or 2 1/2 hotel pan in the chafer!! !